Sally Hansen Complete Salon Manicure boasts 7 benefits in 1 bottle, plus a flawless finish brush for easy application and salon-quality results. Featuring a base coat, growth treatment, runway-inspired color, top coat, gel-shine finish, chip-resistance, and a strengthener with keratin complex for up to 64% stronger nails, this all-in-one formula delivers up to 10 days of chip-resistant wear. It's everything you need to achieve a professional nail look at home! Available in a wide range of stunning shades. About the Brand: A household name, famous for its dedication to making innovatively-formulated, affordable beauty products for real women, Sally Hansen is the number one nail treatment and colour brand in the U.S.A offering consumers solutions for every nail care problem.It puts the power of self-made beauty in your hands, with salon-tested solutions, on-trend colors and high quality nail care products. Explore the entire range of Nail Polish available on Nykaa. 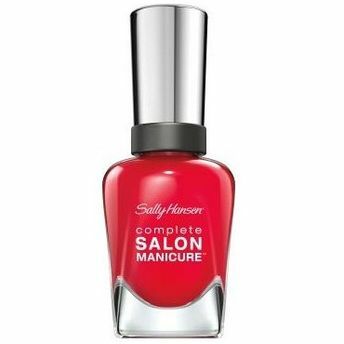 Shop more Sally Hansen products here.You can browse through the complete world of Sally Hansen Nail Polish .Alternatively, you can also find many more products from the Sally Hansen Complete Salon Manicure range.